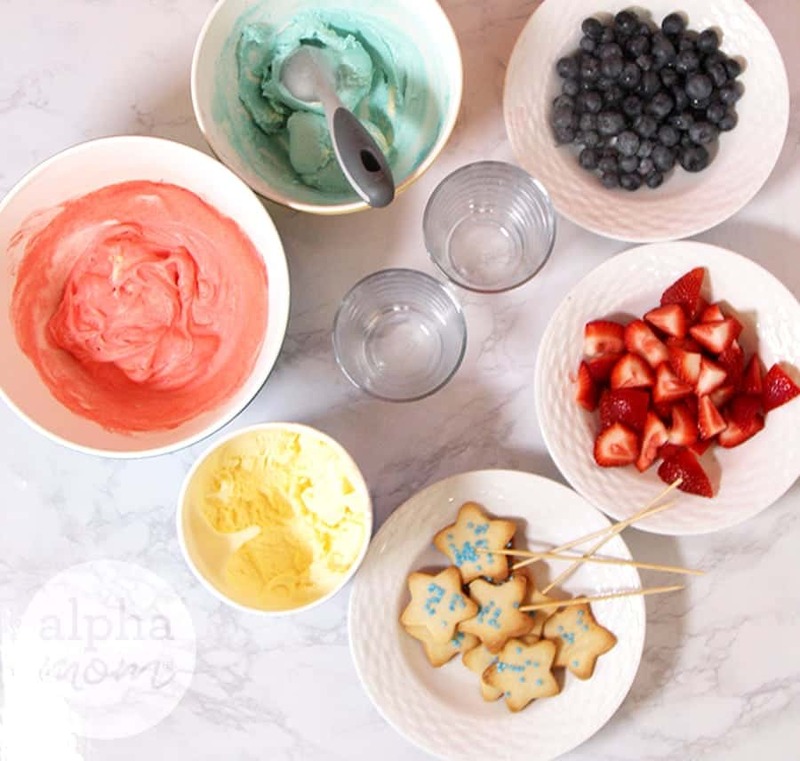 I decided I’d seen enough flag cakes at parties and we needed to invent an Ice Cream Sundae for Patriotic Holidays instead because everyone loves ice cream… especially on a hot summer day! Then we topped it with a Star Sugar Cookie to be extra festive! First we made the cookies from simple sugar cookie dough. We used this recipe but you could just as easily buy store-bought dough, too. The trick to making sugar cookies on a hot day is refrigeration, lots of refrigeration. We also rolled our dough between two pieces of parchment and that kept it thin and more workable. The freezer also works great. We popped our dough into the freezer between batches to keep it nice and firm and not sticky. We even decided to make a few cookies on a stick and added some star sprinkles for extra flare. You can do this by pressing a half of a skewer into the dough and then baking. Skewered cookies looked really cute popping out of the top of our sundaes but even cookies without a stick would still look great just wedged on top. 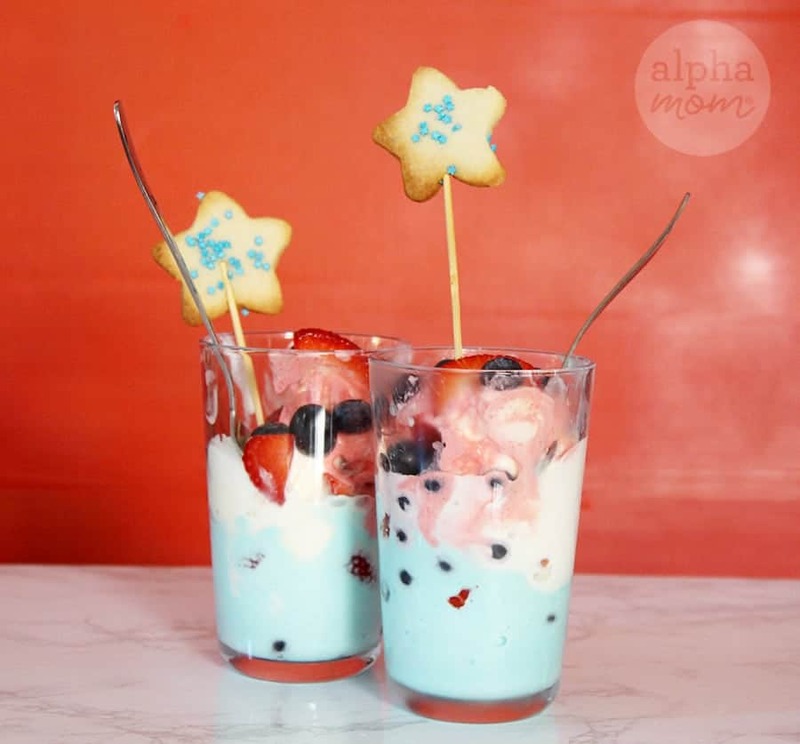 While our cookies were baking we made our special “patriotic-themed” ice cream sundae. 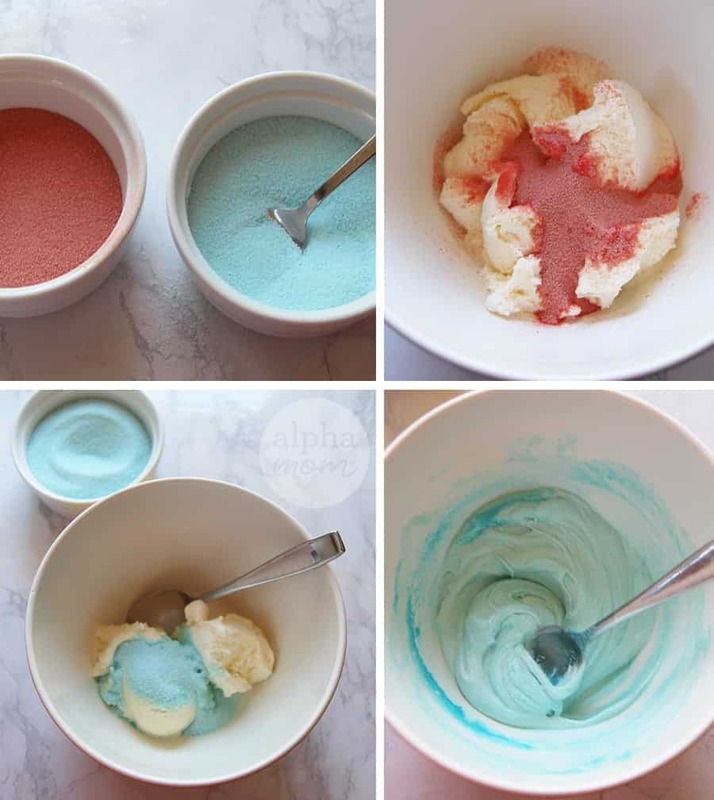 We could have bought bubblegum-blue ice cream and strawberry-pink flavored ice cream but we decided to color our vanilla ice cream with gelatin-mix powder instead. (Drink mix powder would have worked too.) It worked like a charm and added extra flavor, too. 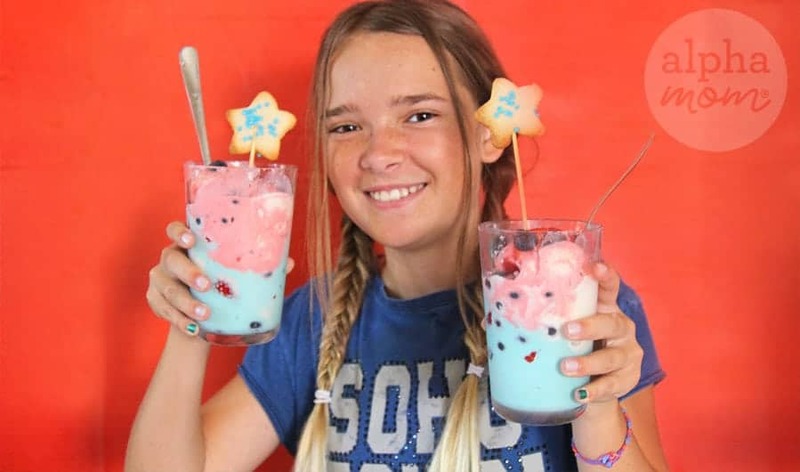 We used strawberry to make red coloring and some kind of “berry-blast” flavor for blue coloring. Add a spoonful at a time of gelatin mix powder to a portion of vanilla ice cream until the color as deep as you like it. Mix, mix, mix and then put back in the freezer to re-freeze. We made the cookies and ice cream a day before we made our sundaes but you could probably do them on the same day as long as you let the ice cream harden for at least an hour in the freezer. Finally we were ready to assemble our Patriotic-themed Sundaes! We set everything out in white dishes so it was easy to assemble. 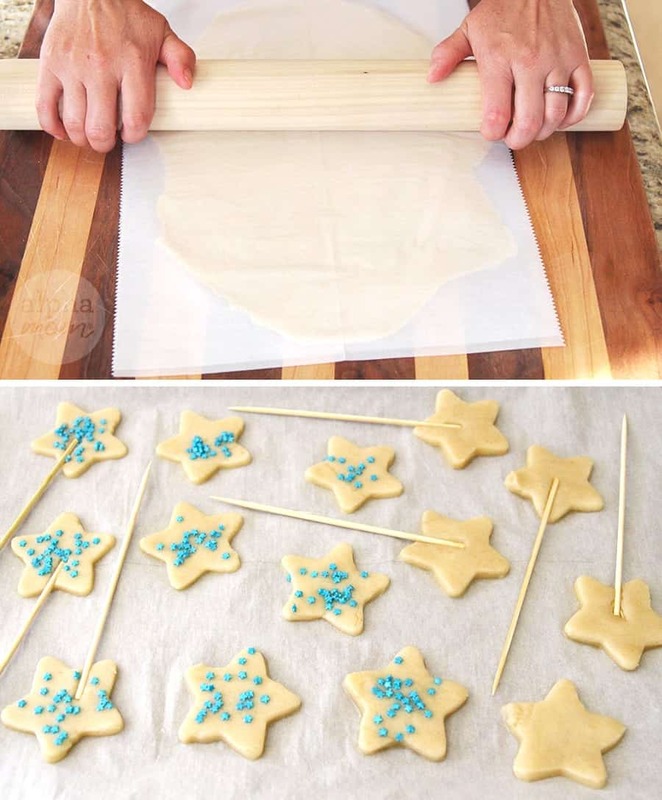 a star cookie on a stick! 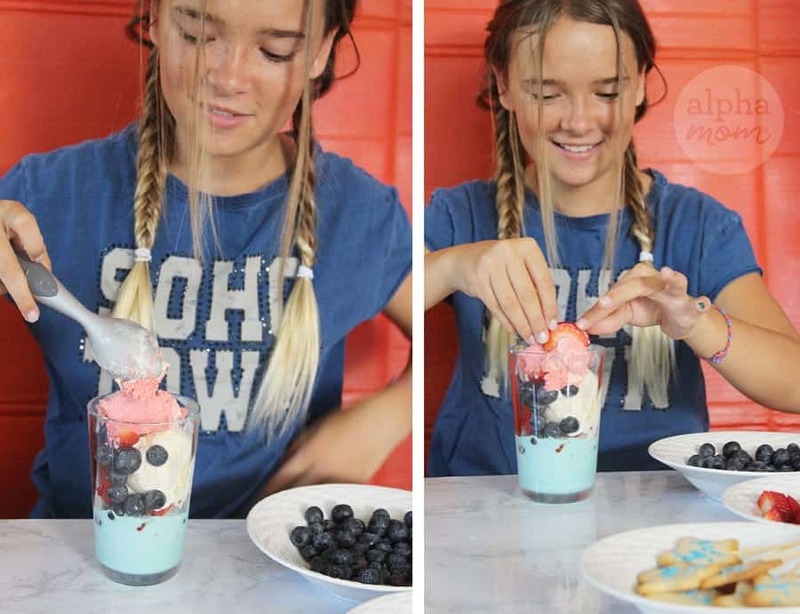 We scooped one color at a time and added blueberries and strawberries in between layers. Then we decorated it with another strawberry and our star cookie! Then, eat your sundaes quickly before they melt! As you can see we took our time and took pictures too long and they did melt but that turned them into delicious milk shakes which are also great.